First impressions are lasting ones, so the first view of your home to family, friends or even a stranger is one that will be embedded forever. What do we mean when we say first view? Well, we mean the one on the outside of our home, your curb appeal. It's a place that many of us seem to forget about. Granted most of us spend the better part of our days inside our home and not in our front yards so we tend to over look things like the rusting fence posts, weathered boards and the loose rocks that seemed like a good idea but that you have now realized just makes a mess. And the good thing about improving the curb appeal...you might actually want to sit out on the porch and soak in some rays of sun while you enjoy your favorite drink. 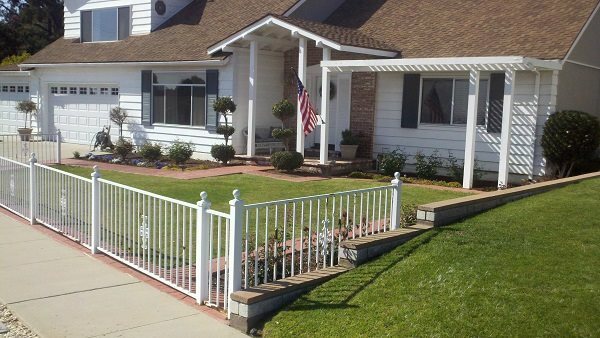 Follow along as we take you through a recent frontyard remodel. Take a look at the fencing, the paint has chipped on these metal fence posts and now they are beginning to rust. Once upon a time these rocks seemed like a good idea, reality, they are constantly on the sidewalk or the street, it's time for something new. At the front of the house you will see that the wood on the trellis is weathered as well. The paint is chipping off and the wood is starting to rot. 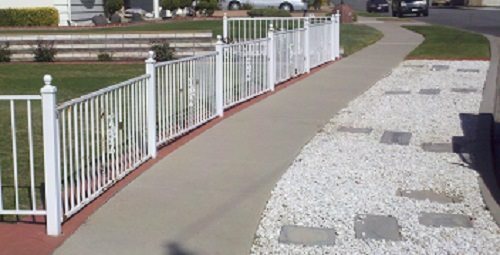 By replacing the metal posts with an all weather product, we used Timber Tech railings, we now have a fence in the front yard that has a 25 year warranty and that is made to last. This product is amazing, it resists scratching, splintering, stains, fading, mildew and mold. You will also notice that we redid the brick work under the fence, and replaced the rocks with new brick and concrete.